The year is almost exactly one fourth gone, so this is more than a bit late. But 2010 was a transformative year in my astronomical career, and I wanted to explain why and how, and to assess how I did on my astronomical New Year’s resolutions. I’m calling this one a mixed success. On one hand, I did a LOT more observing in 2010 than in any previous year. Not in terms of sessions–I did 95 in 2010, versus 110 in 2009–but in terms of time spent and objects observed. In 2009 I probably observed a few dozen things; in 2010 I saw more than 200, the great majority of which were new to me. I got off to a strong start, taking advantage of the good sky transparency after winter and spring rains to do a lot of observing from my driveway, especially with binoculars. I completed the Binocular Messier Club by mid-February, and did most of the observations for the Messier Club and Deep Sky Binocular Club between January and March. Crucially, I finally started getting out to dark sites on a regular basis. 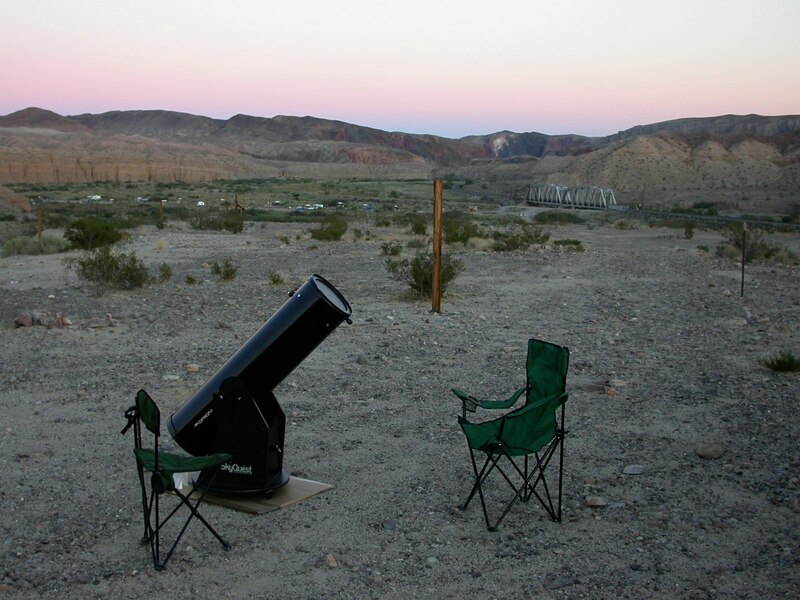 I first started observing in October, 2007, but I had only been on one dark-sky observing trip before last year. Two factors played a role here. The first was getting up to Mount Baldy with a friend from the PVAA in the fall of 2009 to try to catch the impact of the LCROSS mission on the moon. We didn’t see the impact fireball–no one on Earth did, not directly, although the LCROSS probe sent back good pictures and data showing that yes, water ice is indeed present in the craters at the lunar poles. What turned out to be more important for me was the revelation of how much more I could see under those darker skies, and the shedload of deep-sky objects I was able to observe that night, mostly with 15×70 binoculars. That night was also a big step forward for me because it was the first time I had taken out my Pocket Sky Atlas and used it to really cruise the skies, rapidly finding my way to new objects that I’d never seen before. So come the beginning of 2010, I knew that quite dark skies were available close by, I had the motivation to get out to them, and I was learning the skills I’d need to take advantage of them. The other big factor is that my son, London, was 5, so he was both more adventurous than he had been, and also required quite a bit less minding. It was time to go camping. My trips to the Salton Sea in January, February, and March of 2010 were solo efforts, although I met up with at least one other PVAA member each time. But almost all of my later dark-sky outings were camping trips. We went to Owl Canyon in June and September (London stayed with Vicki in a hotel room on the latter trip), Joshua Tree Lake and Afton Canyon in October, and the All-Arizona Star Party in November. And we’ve already been out once this year, to the Salton Sea again (the Salton Sea is more southerly and lower in elevation than the high-desert observing spots I’ve been to, so it’s warmer overnight during the winter months). The impact of these dark-sky trips is hard to describe. I have had experiences out under those dark skies that would simply have been impossible anywhere else. I don’t think it’s going to far to say that they have not only changed me as an astronomer but as a human being. I mentioned that my resolution observe more and obsess about gear less was only a mixed success. I did spend less time mooning over telescope catalogs and telescope vendors’ websites, and more time at the eyepiece, so that part was okay. But I also turned over almost my entire telescope collection, selling off old stuff and trying out new stuff in the quest for the perfect lineup. I think every single telescope I own right now was purchased in 2010, except for the Astroscan, which is really London’s. I learned some valuable things along the way. I know now that a 10″ dob is as much big iron as I need for at least the near future. I found my ultimate no-excuses travel telescope. And I got a couple of nice mid-sized telescopes, both of which turn in good images without breaking either my back or my bank account. 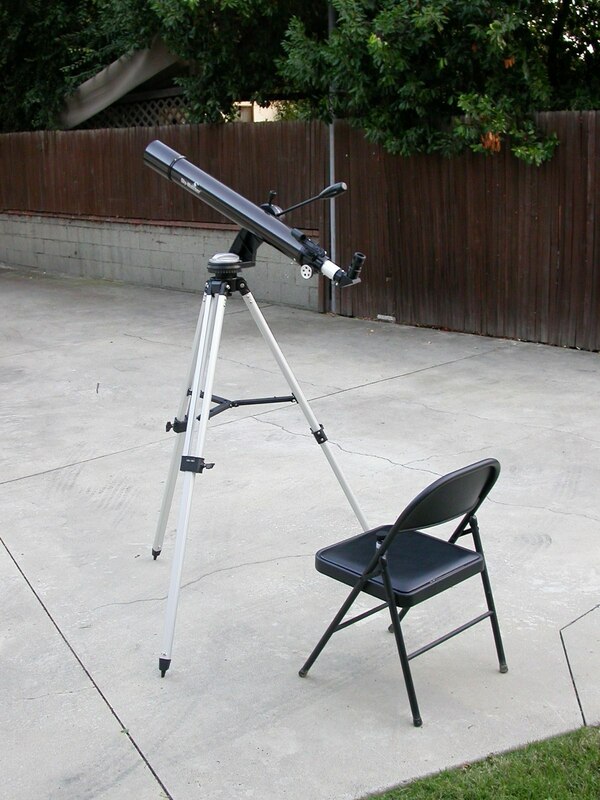 I’m not done buying telescopes–I would like to get a 5″-6″ SCT or Mak to have something more portable than my current mid-sized scopes but equally capable–but I think I’m converging on the ideal scope collection for my observing interests. It wouldn’t hurt me to concentrate on getting some non-telescopic gear, like a light-pollution filter and some better eyepieces. Galileo's sketch of the changing positions of Jupiter's moons--an observation one must repeat for the AL Galileo Club. My other resolution for 2010 was, “I resolve to complete the Astronomical League’s Galileo Club, Lunar II Club, and Messier Club.” This one was also a mixed success. As I’ve reported (more than once, and if you’re tired of hearing about it, I don’t blame you), I did complete the requirements for several of the Astronomical League’s observing clubs, just not all of the ones I resolved to finish. This was mainly caused by the big shift in my observing habits mentioned above. Prior to 2010, essentially all of my observing was done from home, under light pollution, and so I naturally gravitated to projects that were easy to complete under those conditions. Hence the interest in the Lunar II and Galileo clubs (although I was also interested in the latter simply because Galileo was The Man). Last year my interest shifted to the deep sky (i.e., objects beyond the solar system: nebulae, star clusters, and galaxies) in a big way, and all of the clubs I completed in 2010 are deep-sky programs. So what about observing programs for this year? I’m only 9 objects away from completing the Urban Club, although I let a few of them slip too near the sun so I won’t be able to put that one to bed until a few months from now, when they’ve escaped (or, more accurately, when our orbit around the sun has moved the sun’s apparent position against the background stars). I should do more on the Double Star Club–like the moon and planets, double stars are little affected by light pollution, so those will give me something to chase on the nights when there’s too much humidity, smog, or dust to go after faint fuzzies. 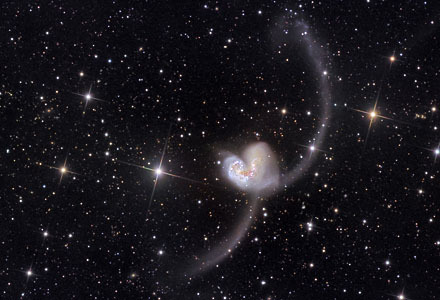 NGC 4038 and 4039, a pair of colliding galaxies popularly known as the Antennae. Part of the Herschel 400. But those are really incidental. My big observing push for the foreseeable future is the Herschel 400, a list of 400 of the best out of the more than 2500 deep-sky objects cataloged by William Herschel. It’s deliberately intended as a follow-on to the Messier Club, to help observers further develop their skills and see more of what’s out there. I started on it last fall, not in earnest but as a way to pad out my sessions as I finished up the Messier and Caldwell lists. Quite a few of the objects for the other deep-sky clubs are drawn from the Herschel 400, so between having completed a few of those and having started on the Herschels last fall, I’ve got almost a quarter of them–95 out of 400–logged already. Sounds like quite a bit of progress, but most of those 95 were chosen for other clubs because they’re among the best and brightest, so I’m afraid many of the gems are already logged and the remaining 305 are going to be mostly true faint fuzzies. Still, one never knows until one looks, and even my limited exploration of the rest of the Herschels has turned up some surprisingly beautiful objects. So, I’m going to work on the Herschel 400, but I’m not going to commit to finishing it this year. I had a lot of fun last year but almost suffered from observing program burnout. This year I’m going to take a more relaxed pace. If I finish a few things along the way, great, but I’m not going to push myself to do it. Still, I am not without goals, and even though three months have passed I’m going to make some astronomical resolutions for 2011 (only having 9 months to work on them ought to add spice). Resolution #1: I resolve to not give up on observing from home. All the dark sky trips in 2010 were great, but after a strong first quarter I did a lot less observing from home after March. There is a danger here, of developing the attitude that it’s not worth going out unless I can be under inky-black skies. The truth is that there is a lot of great observing to be had in town, especially if one chooses the right targets and the right times to observe. As I ought to know, since I got so much deep-sky work done from my driveway last year, mostly with very modest instruments. So I am going to try to get in at least one or two serious observing sessions from home every month, light pollution be damned. Resolution #2: I resolve to spend more time on every object that I observe. This one is also a reaction to my experiences last year. Some people dismiss observing programs as a list-checking exercise that corrodes the relaxed, contemplative side of observing. I don’t think that’s universally true–I always take at least a couple of minutes on each object to jot down my observations and impressions–but I would be lying if I denied that that danger exists. So one of my goals for 2011 is to improve the quality of my observations, and not to worry about their quantity. And…that’s it. That’s all I really want for this year. I certainly grew as an amateur astronomer in 2010. In 2011, I want to mature as an observer. Well, I am going to make the comment that dare not speak its name. This is more or less how I feel about amateur astronomy, and I’d love to understand why you don’t. I mean, I have felt the thrill of seeing Jupiter’s moons, and it was truly thrilling, but I feel like I’ve done that now. I don’t feel the need to keep going back and looking at them, or at Andromeda or what have you, over and over again. And here’s why: when you look at, say, a sauropod vertebra, whether you are a professional or an amateur. You can measure it, you can compare its proportions with those of other vertebrae, you can examine the texture of the bone; you can use these comparisons to determine its taxonomic affinity, its serial position, its ontogenetic stage; you can use this information to formulate and test palaeobiological inferences … Well, I don’t need to tell you how it goes. My question is: what can you do in astronomy that is analogous to all this? It feels to me that an amateur is limited to the kind of thing we all did as kids when we saw dinosaur skeletons: we looked at them, we said “Hey, cool”, and we went on to the next one. With palaeo, we both know how to push on past that stage and start making science; but from out here, it seems that in amateur astronomy, there IS no next stage — that all the good stuff, the ability to actual advance the science, needs way more serious equipment than any individual could ever own. You can measure it, you can compare its proportions with those of other vertebrae, you can examine the texture of the bone; you can use these comparisons to determine its taxonomic affinity, its serial position, its ontogenetic stage; you can use this information to formulate and test palaeobiological inferences … Well, I don’t need to tell you how it goes. My question is: what can you do in astronomy that is analogous to all this? For me, nothing whatsoever! IMHO, you are making the same category mistake that many people make about religion and science: denigrating the value of something because it’s not science. Or in this case, because it doesn’t generate data. That’s not what the game is about, at least not for me. Well, I can speak only for myself, but I think I can illustrate for you what I get out of this pursuit best by paraphrasing your question. I feel like I’ve heard all of Fire of Unknown Origin now. I don’t feel the need to keep going back and listening to it over and over again. I feel like I’ve read Pride and Prejudice now. I don’t feel the need to keep going back and reading it over and over again. I feel like I’ve smelled a rose now. I don’t feel the need to keep going back and smelling them over and over again. When I approach the eyepiece, it’s for the same reason that I like to go hiking in beautiful places: the combination of exploration and intellectual and aesthetic appreciation. Just because I’m not taking measurements or generating data doesn’t mean that I’m not learning things. Because every time is going to be a little bit different. The vagaries of celestial mechanics, atmospheric turbulence, optics, and psychology means that what appears at the eyepiece is going to be at least subtly different than anything I’ve seen before, and my reaction will also be a bit different than any reaction I’ve had before–even if it’s something I’ve looked at before. One of the great unanticipated benefits of keeping an observing log is that now I can compare what I saw when I looked at the Sombrero Galaxy on multiple occasions. There is also the nice feeling that comes with getting some command of a body of knowledge, even if it’s a body of knowledge to which one is not contributing. It would be very poor if one had to contribute to a science to enjoy it. As I said, I can speak only for myself. We are all drawn to different things and get different rewards out of our pursuits. 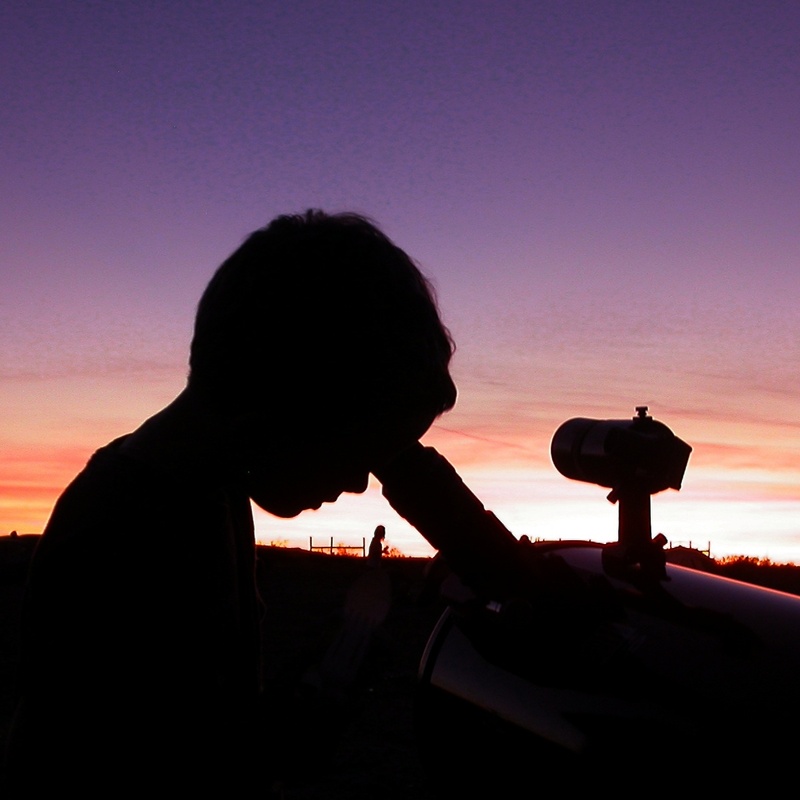 If this is how you feel about amateur astronomy, it’s a useful realization–some people spend thousands of dollars on equipment trying to force a fascination that just isn’t there. Others of us would be deliriously happy if someone dropped us off in a dark field with a pair of binoculars for several hours. You may not feel that way about stargazing, but you probably feel that way about something, so hopefully you can appreciate my position even though you don’t share it. It answers my question perfectly: because you talk about astonomy here in the same kind of way that you talk about sauropod vertebra over on a blog that I won’t insult your intelligence by naming, I’d assumed that you saw astronomy much as you see palaeontology; but now I see that for you, it’s more like listening to music, or reading books. In short, it’s more art than science for you. Which, yes, of course, is perfectly rational. I would analogise it with something like my fascination with Sondheim’s musicals — not a field I am every going to contribute to, but one where there is, as you say, a satisfaction in accumulating a body of knowledge for its own sake — and where all that knowledge eventually gives rise to actual insight.